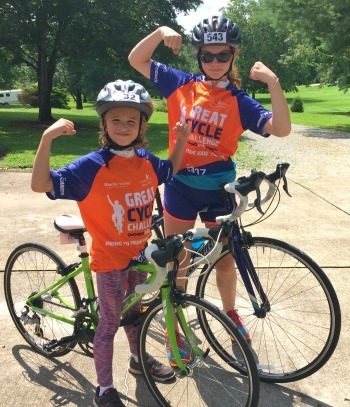 Great Cycle Challenge USA has one goal...to end childhood cancer! Check out our fundraising tips below or use the links above to ensure you reach your fundraising goal to give these kids the brighter futures they deserve. Follow these steps to ensure your challenge will make an impact to change the lives of kids living with cancer. Make sure you set a fundraising goal on your profile page. Your friends will be more likely to sponsor you if they know you have a personal goal...and they'll help you achieve it. The higher your fundraising goal, the more support you'll receive from your friends, family and colleagues. And if you raise $500, you'll receive a FREE 2019 Great Cycle Challenge USA jersey! Make it personal and customize your profile page to make it your own. Tell your story, upload your photo and keep your sponsors updated throughout your challenge to share your journey to fight kids' cancer! Log in now to customize your profile page. Be sure to ask everyone you know to support your efforts to fight kids' cancer! You never know who will sponsor you and donations can come from the most unlikely places. Share your personal story and the goal you hope to achieve, and then let people make their own decision to sponsor you. If you never ask for support, how will people know to support you? Send an email to your friends, family and work colleagues to tell them about your personal challenge to fight kids' cancer! Not sure what to write? We have a range of prewritten email templates for you to use which include your personal details to make it easy for you to send out. Simply log in to your account to view our email templates. Facebook is the perfect channel to communicate your goal, update your friends and ask for support. Customize your Facebook profile. Upload your very own personalized profile pic and timeline image to tell everyone about your challenge to fight kids' cancer! Simply log in and go to the 'downloads' section of your dashboard. Post regular status updates. Post weekly updates through your Facebook page to communicate your personal progress to your friends and family. Send a personal message. Send a personal message through Facebook to ask specific friends for their support - there's a good chance they would have already seen your status updates but it's nice to be personally asked! We have a range of posters for you to put up at your school, workplace, cycling club or local coffee shop etc. Put up posters to tell everyone about your challenge to fight kids' cancer!